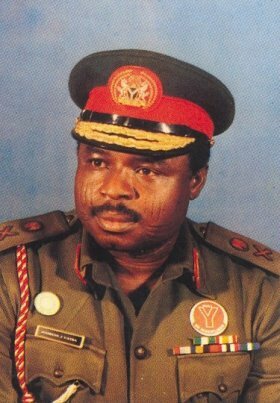 On this date in 1986,* Nigerian Major-General Mamman Jiya Vatsa was shot (along with nine others) by command of his childhood friend — the dictator Ibrahim Babangida, whom Vatsa was allegedly plotting to overthrow. A gifted writer since youth, Vatsa was just a nameless twenty-something junior officer in the early 1970s when he emerged onto the national literary scene. In the 15 years before his death, Vatsa churned out 20-plus volumes, mostly poetry. He had a special inclination for writing for children. Simultaneously, his star ascended in his professional sphere. Risen to General, Vatsa was part of the Supreme Military Council of the previous dictator. Vatsa and dozens of others were arrested. Testimony against them — much of it of the speculative or torture-induced variety — described a ring of officers piqued at the Babangida coup (Vatsa was out of the country when it occurred) and keen to undo it. The scheme would have been only one of many such hatched or imagined in an unstable political situation that surely made the new big man nervous. In the end, “only” ten (the nine others are named here) were stood up against the wall for the alleged plot. Many others, however, were imprisoned or purged, a lasting injury to the Nigerian brass that particularly crippled its air force. The fatal tribunal’s judge** is less certain, and is hardly the only one to doubt Vatsa’s guilt outright. I don’t know, nobody ever asked. That was how some heroes died. * Some sources give March 6 as the execution date, but contemporaneous western press reports (admittedly an impeachable source) prefer the 5th. For instance, the March 6 Chicago Tribune says the executions occurred on “Wednesday” (the 5th). ** Ironically, Vatsa himself had once sat on a tribunal for another group of failed putschists, the 1976 Dimka coup.